-- From John's son by his first wife Blanche, Henry IV, comes the line of Lancaster (Red Rose) kings. Through Blanche, John held the title of the Duke of Lancaster. 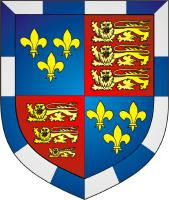 -- From Katherine and John's daughter, Jean, you have a direct line to two Yorkist Kings: Edward IV and Richard III, both of whom were Katherine and John's great-grandsons. Their great-great-granddaughter, Elizabeth of York, was the first Tudor queen. -- From Katherine and John's oldest Beaufort son, John, you have a direct line to the first Tudor King, Henry VII. So the founders of the Tudor line, Henry VII and Elizabeth of York, were both great-great-grandchildren of John and Katherine! In fact, this was clearly recognized at the time and because of consanguinity, the two had to get papal dispensation to marry. -- Joan, who was John and Katherine's granddaughter, married James I of the Scottish Stewart kings. So when James VI of Scotland became James I of England many years later, it was, again, a direct Beaufort descendant who took the throne.